Conor Morgan, graduated from Dundee University in 2011 and recently completed his Masters in Cosmetic and Restorative Dentistry with Distinction. 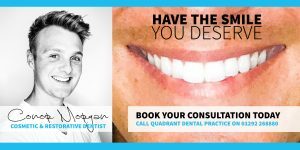 He takes a vast amount of joy and pride in his work and is now receiving referrals from inside and outside the practice for all kinds of Cosmetic and Restorative Treatments, including complex Cosmetic Tooth Alignment cases. Should you have any questions or wish to book a consultation with Conor, feel free to contact Quadrant Dental Practice, Ayr (South Ayrshire) on 01292 268880 where our team will be happy to help.